Dermarolling / Microneedling / 70% improvement of stretch marks after 3-4 rollings. True? >My name is [deleted], I'm 22 years old from Beirut, Lebanon. >result i got stretchmarks on my upper arms, thighs, breasts,a nd hips. >doctor, but ifound it extremely expensive. >After researching, i came across your website. >would result in at least 70%improvement in stretchmarks. >In your website,you said that improvement cannot be noticeable until a year or so.You didn't provide any cumulative percentage for the improvement. >to get married next Fall,and i really would like to wear a strapless >wedding dress. So I hope your dermaroller would be helping me in this. Sorry for my delayed answer. I was on holidays. First of all, congratulations with you wedding and with your weight loss (provided it was intended). You must be a pretty girl. A dermaroller in combination with single needling can dramatically improve the stretch marks but it cannot remove them. The extend of improvement is highly individual and such claims that ALL customers will always achieve at least 70% improvement are totally unsubstantiated so they're simply a marketing trick. They are lies. At least 70% improvement means that the stretch marks are almost gone in all their customers. That is totally impossible. Some of our customers achieved very good results. The stretch marks are still there but much less visible, their texture improved and they blended more with the surrounding skin - color-wise. Some customers achieved an improvement very quickly (2 months), some much later and some none at all. It means that such improvement is possible but it doesn't mean that everybody achieves it. You have to do your best to achieve it and you might succeed but I cannot make promises because nobody knows why it works with some people and with some it doesn't. The same with laser, acid peels, facelifts etc. Not everybody achieves the same level of improvement. 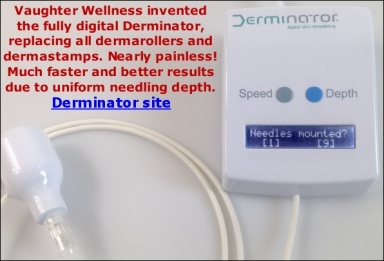 If you want me to promise you that by this fall, your stretch marks will be 70% improved with a dermaroller - well I can't so in that case it's better not to buy from us. I prefer to be honest and say you may achieve results pretty soon but usually it is not that easy and lots of perseverance and patience is needed. Is the color of your stretch marks red or white? The only way to quickly achieve improvement for your wedding day is to roll the stretchmarks just before it. The skin usually remains red for one day and it makes the stretchmarks temporarily less visible. This is not a permanent improvement - this is just a temporary inflammation that makes the skin bit red. You would of course have to try it for a long time prior to the wedding and find out how your skin reacts. If the stretch marks indeed do look less visible for 24 hours or if it actually makes them more pronounced etc. You would have to experiment a little. If you want a permanent improvement, you will have to be patient and keep on rolling with 1.5 mm + single-needling + using vit. C serum. Sorry that I do not have better news for you..
Dermarolling / Microneedling / About disinfectant! You do not mention the name of the disinfectant, or its ingredients but you can be near-certain that it can't damage stainless steel (the material the needles are made of). Even if it were to corrode stainless steel, the steel particles would end up mainly in the disinfectant, not in your skin. But even if they were to end up in your skin, it would be totally harmless. Distilled water is fine to use with Ethanol, yes. Dermarolling / Microneedling / Dr. Roller OR Sarah Vaughter dermaroller?? You definitely need the 1.5 mm one. Swelling and redness usually subsides in hours. Since you only roll with a 1.5 mm roller occasionally, you can do it before a day off, once a month. And of course you could still use a 0.5 mm one for enhanced skin product penetration. No significant redness or swelling with that one, especially not when you sleep over it. (also on the forum in various topics). I do not have any experience with Iodine scar reduction. The results published by Dr Derry are impressive. From the PDF, it appears that Iodine can in some cases aid in the regeneration of scar tissue. I presume this doesn't apply to all types of scars though. I used to disinfect my minor injuries with Iodine and never experienced scar formation. We recommend our customers to disinfect with Ethanol or Betadine, which contains Povidone-Iodine. An antiseptic should not be able to interfere with the needling process, as an antiseptic prevents infection, not inflammation. inactivated by disinfectants and antiseptics. from the eye with your other hand and roll it with the other. Regarding fillers, that area is tricky, amongst other things, due to the thin skin with almost no fat underneath. Significant unevenness of the filler is visible. Some long lasting fillers can cause granulomas. That is very visible in that area as well. You can apply vit. C on the scar. It is an antioxidant and it is needed for collagen production. It is very useful. When you decide to needle the scar, just do a small test patch. A small part of the scar. You will see how it heals. You can apply your creams after single needling but the creams should not be contaminated. If you have been putting your hands for months into a cream that has no preservatives, it might have a fungus or bacteria. It usually only concerns DIY creams as people want to have it preservative-free. It is not going to harm you though because the immune system will take care of it. It is just not a good idea. You should definitely apply a cream with vit. A after needling. Dermarolling / Microneedling / Vitamin C airtight containers? The problem is that vit. C penetrates the skin at pH levels less than 3.5. The pH of vit. C in a water solution is very low so the penetration into the deeper skin levels is high. If you simply mix vit. C and vit. E, the absorption of vit. C might be very much reduced without mixing it with additional solvents and buffers. Don't do it the other way round (first E then C). Water cannot penetrate an oil barrier and vit. C is not fat soluble. The main reason for mixing vit. C with other antioxidants was to enhance its stability in commercial products that have to be stable even after many months since the route from the production to the actual purchase can take a long time, and it has to stay stable after the purchase as well. The advantage of a homemade vit. C serum kept in a dark, airtight container in the fridge is that it penetrates the skin without any additional chemicals and it keeps stable for a relatively long time. It doesn’t prove that it had no effect on collagen production since this was not studied but further studies are necessary to find out. You should roll your entire face every 5-6 weeks with a roller (long needles) and in between you can needle the scars. But you should needle different scars every day (or whatever interval you choose). The same scar should be rolled and needled only once a month. Sorry if my previous posting was confusing. It concerned acne scars but it is valid for other types of scars as well. What I meant by the above posting is that you can needle all your scars in one go but since needled skin sometimes remains red for several days you might not appreciate many red spots on your face, especially if you have to go to work or school. In that case, needle a different scar every day or every second day or whatever interval you choose to avoid showing too many red spots. The same applies to stretch marks for example. You can needle them all in one go or needle one or several stretch marks every day or whatever interval you desire. However, do not needle the same stretch mark more than once a month. You can roll several times a week with short needles (up to 0.25 mm for women and 0.5 mm for men) for product penetration in between your monthly sessions with long needles or needling. Dermarolling / Microneedling / does dermaroller tear the skin? I can understand your concern and you would indeed be right if the skin was made of a relatively rigid material such as aluminium foil over a sponge or something. I think that were one to do such an experiment, one would observe some tearing. However, the skin is a very pliable organ that, when dermarolling, behaves more like a thin sheet of rubber. When happens is that the needle is inserted under a quite ideal angle a little less than 90 degrees. Before the skin can tear, the sharp tip will have pierced the skin and the motion continues downwards from there, not hampered by the hard epidermis but onward through much softer layers, lubricated even by some blood plasma and the natural oils secreted by the skin. The easiest way out is therefore through the hole just created. Very much less force is required to leave the hole than to make the hole - the only force to be overcome is the suction of the tissue around the needle - and the skin is flexible enough to stretch that fraction of a millimeter. It is much easier for the needle to exit via a ready-made opening, stretching the skin every so slightly than to tear through the epidermis, which would be even harder than to make the prick in the first place. I'm not saying that tearing is totally impossible. with very aged, thin and inflexible skin for example, 2 mm needles could cause some micro-tearing. The key here is skin flexibility. As long as your skin has a modicum of flexibility, all will be well, especially with needle lengths of 1.5 mm and below. With greatly aged skin or other skin flexibility issues, I would start with shorter needles such as the 0.5 mm first and work my way up, seeing if tearing occurs. However in general, when tearing starts to occur, the first suspicion is bent or blunt needles. The needles would have to be visibly bent to cause this though. The mask's plastic layer can be removed because it is originally intended for use on closed skin. On "open", dermarolled skin, occlusion won't be necessary for extra penetration. There is a bit too much copper peptide liquid in the mask so it leaks a little. You do not have to use the mask at all - in principle you can wring it out and just use the liquid. Perhaps the best method is to just discard the plastic part and let the mask drip out in its sachet, then use it. Using a paperclip, close the sachet with the remaining liquid and keep it in the fridge. Use that liquid later on your skin, applying it with your fingers. If you want, there is enough liquid in the mask to serve you multiple times. You can cut off a piece of the mask with scissors and smear it all over your face. Put the rest of the mask back. Close it with a paper clip, the next day or some days later cut another piece off the mask and smear it again on your face. In this way the mask will serve you several times. If there are liquids left in the sachet use them as well. The mask is a bit too watery - I agree but it has a high concentration of copper peptides. Sure, but it's not the fragrance that stings, (it's only 0.01% fragrance anyway, John says even 0.01% battery acid would not sting), it's the copper peptides themselves that can irritate the skin. They are known to do that even on non-dermarolled skin, especially in the "high strength" concentration we provide. And on open skin, stinging and redness is common. Removing the fragrance won't change that. You could remove it sooner, if stinging becomes a problem. If you wonder why peptides sting - Peptides are also in the digestive juices of the stomach.. Only these peptides are a bit different :-) Same with Retinoic acid. Stings terribly on open skin. "No pain - no gain", as they say.. I also assume the fragrance is there to mask the smell of all those other ingredients. Without fragrance, the mask may smell weird. > information and was wondering what skin is thick enough for this length? > thickness goes. These areas should all be fine, right? The thickest skin (epidermis and dermis) is (apart from foot soles and hand palms) found on the back. All your other intended areas are also quite thick. The thinnest skin is on the upper and lower eyelids (0.3-0.5 mm). Relatively thin is the skin on the top of the collar bones, in the groin and in the armpits. The neck has usually thinner skin than the face. The face doesn't have the same thickness either. The centre of the forehead is thicker than the sides, the chin is thicker than the cheeks etc. It can vary with age and it varies individually as well. A 2 mm roller doesn't penetrate the full 2 mm into the skin. Males have usually thicker skin as you mentioned. If you were a woman, I'd recommend using a 1.5 mm roller instead. You can control the penetration of the needles by putting more or less pressure on the roller. Getting pinpoint bleeding is normal and OK.
1 Duke University Medical Center, Division of Dermatology, Durham, NC, U.S.A. *NCSU School of Veterinary Medicine, Raleigh, NC, U.S.A.
Summary: Ultraviolet radiation damage to the skin is due, in part, to the generation of reactive oxygen species. Vitamin C (l-ascorbic acid) functions as a biological co-factor and antioxidant due to its reducing properties. Topical application of vitamin C has been shown to elevate significantly cutaneous levels of this vitamin in pigs, and this correlates with protection of the skin from UVB damage as measured by erythema and sunburn cell formation. This protection is biological and due to the reducing properties of the molecule. Further, we provide evidence that the vitamin C levels of the skin can be severely depleted after UV irradiation, which would lower this organ's innate protective mechanism as well as leaving it at risk of impaired healing after photoinduced damage. In addition, vitamin C protects porcine skin from UVA-mediated phototoxic reactions (PUVA) and therefore shows promise as a broad-spectrum photoprotectant. Copyright 2005 American Society for Dermatologic Surgery, Inc.
Background. Cosmeceuticals containing antioxidants are among the most popular antiaging remedies. Topically applied antioxidants exert their benefits by offering protection from damaging free radicals produced when skin is exposed to ultraviolet light or allowed to age naturally. Vitamin C is a naturally occurring potent water-soluble antioxidant. Accordingly, it has been incorporated into a variety of cosmeceuticals designed to protect and rejuvenate photoaged skin. Objective. This article reviews the scientific data and clinical studies supporting the use of topically applied vitamin C for treating photoaged skin. Other innovative uses for vitamin C cosmeceuticals are also discussed. Conclusion. A significant body of scientific research supports the use of cosmeceuticals containing vitamin C. Cutaneous benefits include promoting collagen synthesis, photoprotection from ultraviolet A and B, lightening hyperpigmentation, and improvement of a variety of inflammatory dermatoses. Because of the diverse biologic effects of this compound, topical vitamin C has become a useful part of the dermatologist's armamentarium. Do not needle nevus/moles and try to avoid them when rolling. Rolling over freckles is OK.